Editor’s note: “What watch would you recommend to someone who wants just one do-it-all piece, and that doesn’t require a remortgaging of the family home?” As someone who writes about watches on the daily, this is one of the most common questions I get asked. Usually right after, “How many watches do you own?” While I do love answering the question, it first requires the asker answering a few questions of my own: “What do they do every day? 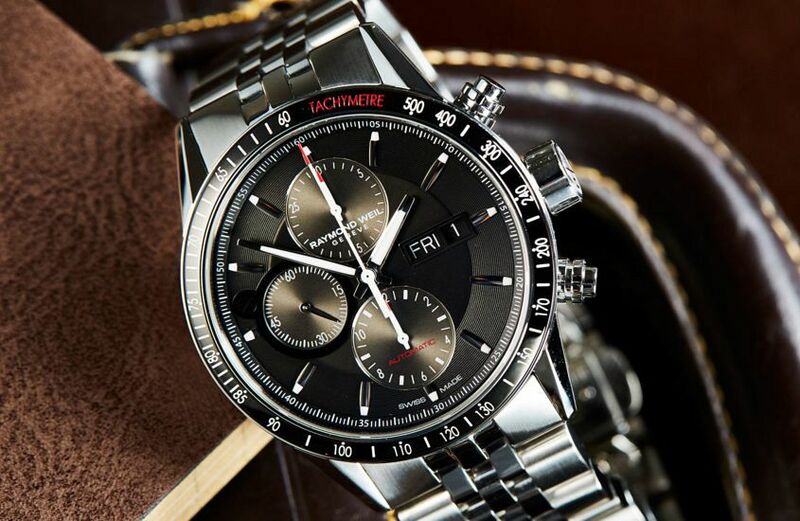 What’s their style?” If they tick all the right boxes, it’s hard to go past the Raymond Weil Freelancer Chronograph. A stylish, versatile and sporty value-driven offering for your every day. The story in a second: A value-packed chrono from one of the few remaining family-owned watch companies. It wasn’t all doom and gloom during the quartz crisis of the mid ’70s. 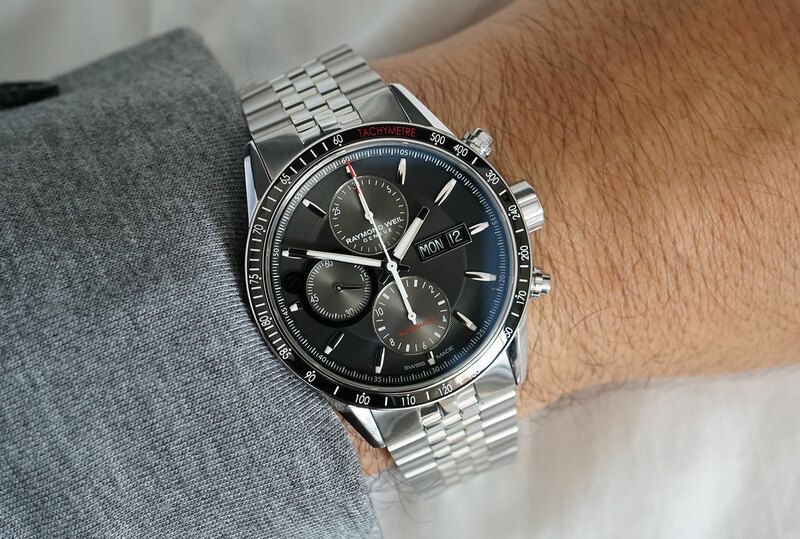 While brands and manufacturers were disappearing left, right and centre, never to be seen again, others like Raymond Weil were only just starting out, which makes them a relative newcomer to the watch world. However, unlike many others, they’ve managed to remain independent and create a diverse catalogue that’s bursting at the seams with collections like the Freelancer. Introduced in 2007, it’s now one of the mainstays of their line-up, and is not only available in standard three-handed models, but also in multi-subdialled chronographs, like this stylish little black and red number we have here. If you’re familiar with the Freelancer range, then you’ll already be well acquainted with the sensibly sized 42mm stainless-steel case. 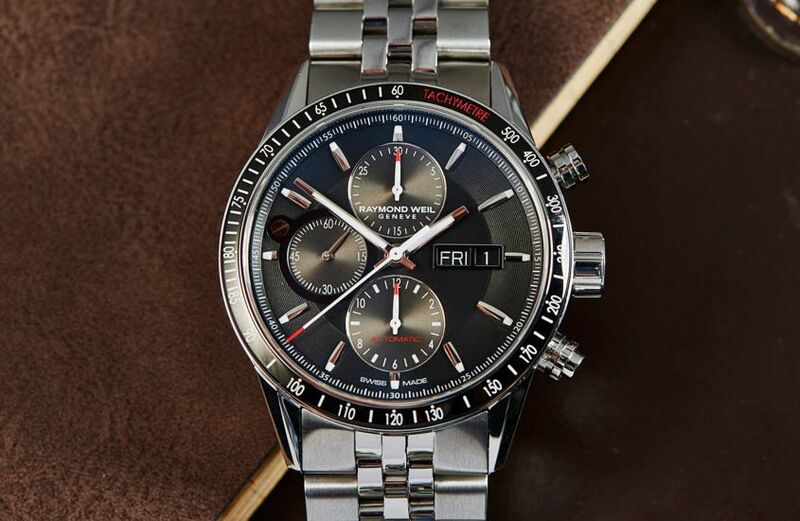 It’s purposeful in its design, sitting at a very reasonable thickness of 13.85mm, with both the chronograph pushers and the crown able to be screwed down. However, it’s not just about functionality, as a wonderful blend of highly polished and satin-brushed surfaces add a touch of class, and thin bevelled lugs play a game of light and shadows either side of the bracelet. Around the outside is a black PVD-coated bezel that is given a subtle pop of red on its tachymeter scale, adding a sense of sportiness that is backed up by the case’s 100m water-resistance rating. As with the case, when it comes to the dial, it’s all about the finishes. On paper, it’s just black, but in reality, each element is carefully textured, and creates its own monochromatic tone. From the slightly-less-than-black satin finished centre to the concentric rings around the outside that cast dark shadows between their lines. Even the sunray finish of the subdials is constantly reflecting, making them more a charcoal grey, and easily distinguishing them from their darker backdrop. Speaking of reflecting, there’s plenty of it going on here. Highly polished hour markers and hands capture the light, making for a highly legible dial that again catches the eye with subtle bursts of red on the tips of the chronograph hands and a single line of text in the bottom subdial. No surprises here: inside is the Caliber RW 5200. Raymond Weil’s reworked version of the venerable Valjoux 7750. It’s self-winding with a power reserve of 46 hours. And although there’s not a lot of decoration, except for the perlage finish of the rotor, it’s not something unexpected to see at this price point, where it’s the go-to choice of chronograph movement — and for good reason, mind you. Raymond Weil make some great bracelets and this one is no exception. And once again, it’s all about the finishes. Jubilee style with three polished centre links that shine a contrast between outer brushed links, it’s solid and comfortable on the wrist. However, it does take some adjusting to when using the double lock folding clasp. Instead of the usual way of closing — top half (from 12 o’clock) first, and then bottom — it’s a little counter-intuitive, and closes the other way around. Not a deal-breaker, but worth noting nonetheless. In a word: sporty and dressy. Okay, that’s two words. But the design really does bridge the gap between a more casual wearer and something that can answer the call up to suit duty. With thin lugs and a sensible 42mm case diameter, despite its heft, it wears really well. Setting itself apart with a combination of good looks, functionality and mass-value appeal, Raymond Weil have paid a lot of close attention to the details. And overall, this Freelancer chronograph looks and feels a lot more expensive than it is. I think what it all boils down to is the clever use of textures and finishes that really make this chrono shine. 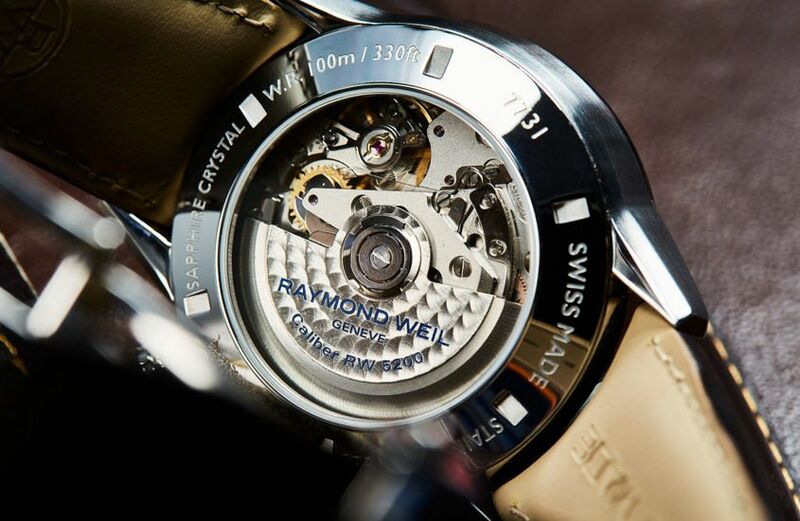 Did you know the current CEO is Raymond Weil’s grandson? Someone looking for their first “real” watch. To paraphrase Missy Elliott, put the clasp down, flip it and reverse it.